What is the Devilian Online game? Devilian was a fantasy massively multiplayer online action role-playing video game developed by Bluehole Ginno Games and published by Trion Worlds. In the game, the player assumes the role of a half-devil, known as a Devilian, which has two forms, a normal form and a devil form, which level up individually. Before battle royale games' rise, Bluehole and Trion Worlds developed and published their MMORPG Devilian for Windows PC Steam platform in 2015. This is an online video game with a Diablo-like perspective. 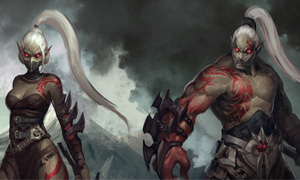 You can start your Devilian journey with four given classes: Berserker, Evoker, Cannoneer, and Shadowhunter. Each class has their unique gameplay but not all classes suit every player, just choose a suitable one to start the game. Devilian Berserker Triple Slash is the most common seen melee skill, while Earthcraker can make group of enemy stuns. In the vast, persistent world of Devilian's free-to-play and fully-featured MMO-ARPG environment, you will take up arms as a mystical Evoker renowned for destructive spellcasting, or a Tempest wielding two daggers and ninja like relfexes. You can join group PvP with thousands of other players, or to challenge dungeons all over the map. Besides, Crafting gears, completing Quests, make Devilian Gold from Trading, travel in Cities by Mounts, fight with your Pets, battle for your Guild, it's a full pack of MMO gameplay elements you are ever seeking for. Why should players to Buy Devilian Gold from Joymmo.com? Devilian Gold is the main currency in the game, which can be used to purchase many items in-game, and upgrade skills. Joymmo.com is the best professional seller of Devilian Gold with many years' experience. Full stock and servers are available.